Shopping for Scooby-Doo Model Kits? Build The Mystery Machine with this cool model kit! Scooby and Shaggy figures included. Rolling wheels, opening back doors, and more! "Scooby-dooby-doo!" 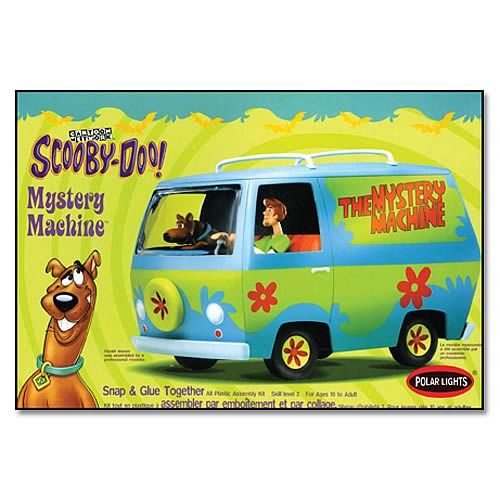 Based on the popular cartoon series Scooby-Doo, The Mystery Machine comes with pre-painted figures of both Scooby and Shaggy. This easy-to-assemble snap-and-glue model kit features rolling wheels, opening back doors, and bonus glow-in-the-dark stickers, too! Scooby-Doo, where are you? Ages 8 and up.